Since the mid-19th century, most farmers used the moldboard plow as their primary tool. This implement overturned the soil and buried the previous crop’s residue, leaving only fragments covering less than 15 percent of the soil surface. In the last 50 years, farmers across the country began using less aggressive primary tillage tools such as the chisel plow. This tool allowed farmers to conduct tillage more efficiently at a lower cost, and had the added benefit of reducing soil erosion from wind and water. 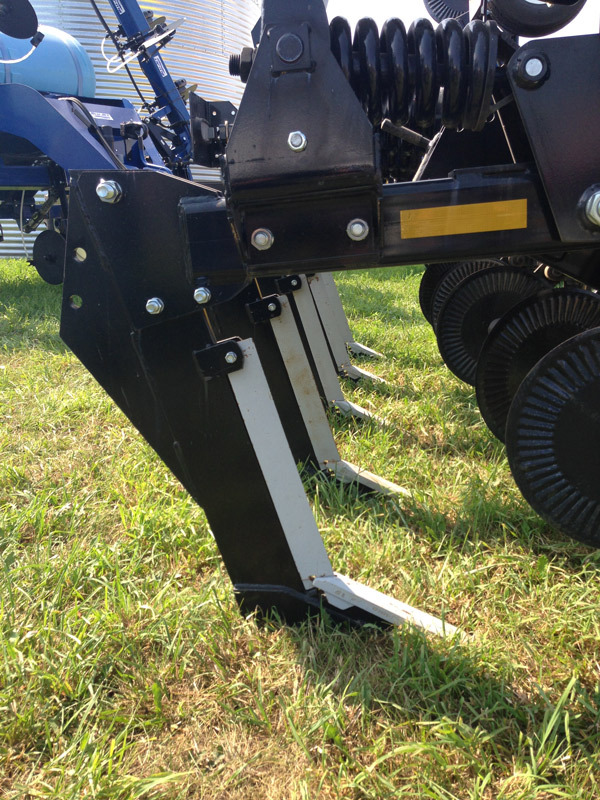 Today, numerous additional tillage implements are available on the market that increase tillage efficiency and reduce soil disturbance and erosion even more. These new implements have countless options for shank, coulter, disk and harrow configurations with adjustable depths and pitches. Modern implements allow farmers to control the aggressiveness of their primary tillage and manage the amount of residue left on the soil surface. Moldboard plowing inverts the soil to a depth of 8 to 12 inches, which is measured to the moldboard share’s bottom edge (Figure 1). 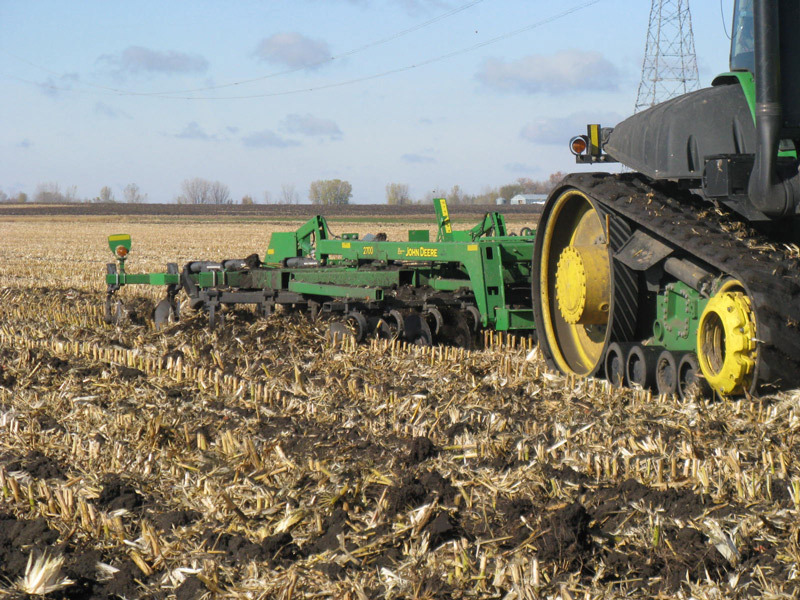 Typically, moldboard plowing is conducted in the fall, requiring farmers to make one or two secondary tillage passes with a field cultivator or tandem disk before planting. This smooths the soil and pulverizes any remaining large soil clods. Moldboard plowing is the most aggressive tillage practice available and leaves less than 15 percent of the soil surface protected with crop residue during the months after planting (Figure 2). Because it’s the most aggressive tillage option, it also has the highest potential for soil erosion by wind and water and has high fuel, time and labor cost requirements. Unlike the moldboard plow, a disk ripper doesn’t completely invert the soil. Instead, it tills the soil to a depth of 12 to 16 inches with a series of shallow disks, shallow leading shanks (optional) and then deeper, larger shanks (Figure 3). Some models have broad or winged points on the shanks that increase the amount of soil disturbance. Disk ripping often leaves 35 to 45 percent of the soil surface covered by crop residue, even though it tills more deeply than a moldboard plow. 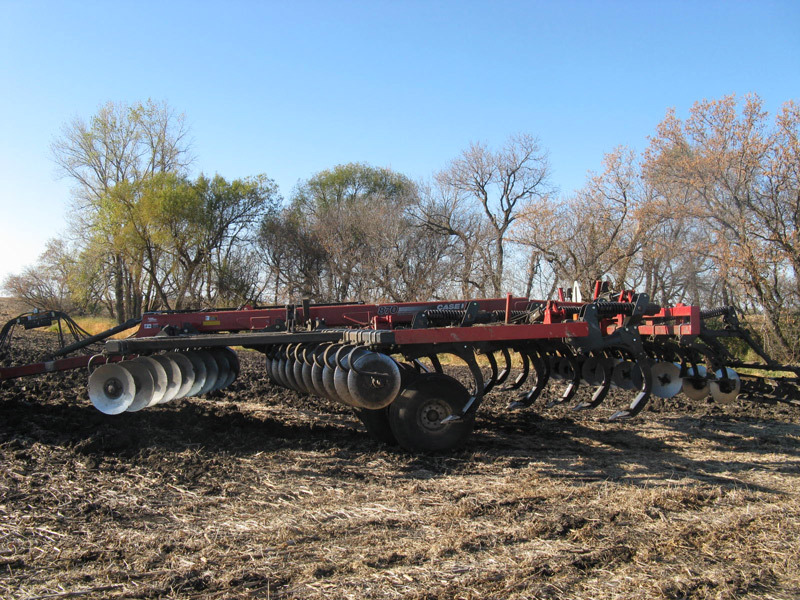 After disk ripping in the fall, you’ll need one or two secondary tillage passes with a field cultivator or a tandem disk in the spring before planting. Since more crop residue is left on the soil surface, the potential for erosion is less than the moldboard plow (Figure 4). However, disk ripping has high fuel, time and labor cost requirements due to the deep depth of tillage. 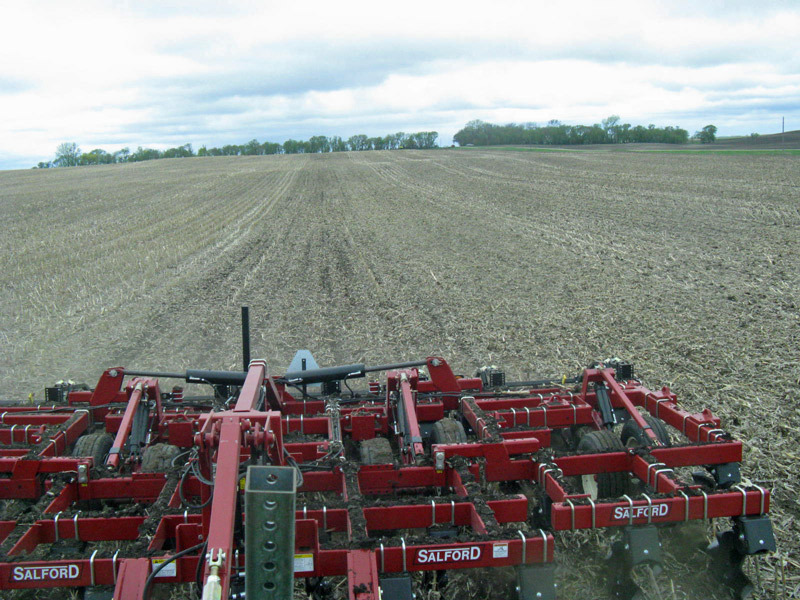 In-line subsoiling, ripping or paraplowing are more generally referred to as deep zone tillage. In-line implements create evenly spaced, 30-inch rows of 15- to 20-inch-deep slots using a narrow subsoil shank (Figure 5). Shanks may be completely straight or have a bent leg, called a paraplow. Deep zone tillage is done in the fall and the crop is then directly planted over the tilled rows. These implements fracture and break up deep compaction zones and incorporate little crop residue. Therefore, crop residue coverage at the soil surface is left nearly intact. Only consider zone tillage if you know deep soil compaction exists. If the subsoil isn’t compacted, then you won’t see yield benefits from subsoiling. These implements also have a high horsepower (hp) requirement of 30 to 50 hp per shank. The chisel plow tills the soil to a depth of 6 to 8 inches using rows of staggered shanks that can be configured in several different designs (Figure 6). The choice of chisel plow point (shovels, straight points or sweeps) will vary the level of soil disturbance and affects the amount of crop residues remaining on the soil surface. Preceding the shanks are a gang of straight coulters or disks that size the residue to reduce plugging. Chisel plowing is typically conducted in the fall and is followed by secondary tillage with a field cultivator or tandem disk in the spring before planting. The secondary tillage pass in the spring further lowers the residue coverage. It’s ideal to leave more than 30 percent residue coverage after planting to reduce erosion. Fall chisel plowing should leave 40 to 45 percent residue on the surface after the chisel pass. Farmers can choose from numerous designs and adjustments to the shanks, shovels and sweeps to affect the amount of residue incorporated. For example, a chisel plow equipped with 2-inch straight shovels will leave 11 percent more residue than a 3-inch twisted shovel. 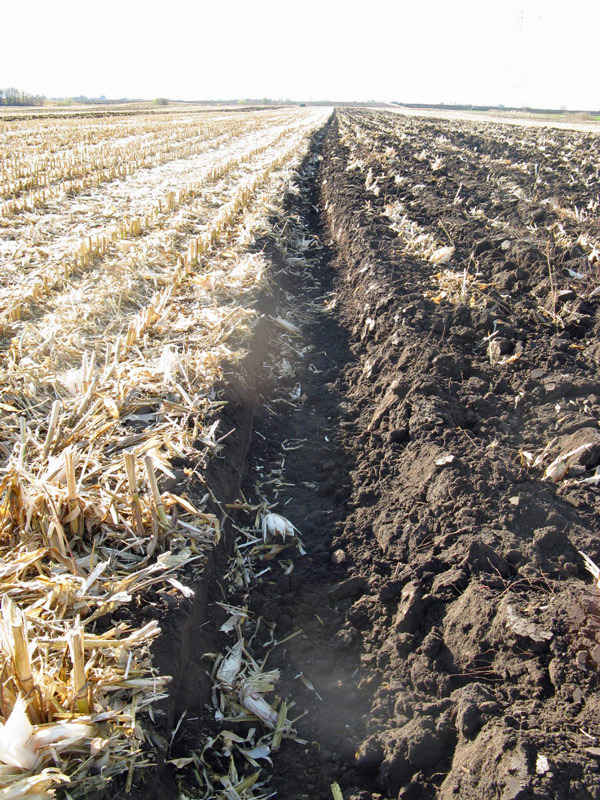 Fall chisel plowing that results in 30 percent crop residue cover after planting can reduce the gross amount of soil erosion by 50 to 65 percent compared to moldboard plowing, which leaves less than 15 percent residue (Figure 7). Additionally, chisel plowing in the fall has a moderate fuel, time and labor cost requirement. This prepares narrow 7- to 10-inch wide bands of soil for planting, while leaving the soil and residue between the plant rows untouched as in no-till. Fertilizer is often placed 5 to 8 inches deep in the soil immediately behind the primary shank (or coulter) during tillage. This combines the best of both tillage worlds. Strip till has a warmer, drier seedbed compared to no-till. This makes it possible to match the early planting dates and high yields of conventional tillage, while its higher residue cover provides the erosion control and improved water infiltration that no-till offers. The spacing of tilled strips corresponds to planter-row widths of the next crop so seeds are planted directly into the tilled strips. As a result, strip till is well-suited for controlled traffic management. Most strip-till equipment manufacturers in the northern Great Plains produce strip till implements with 30-inch, 22-inch or 20-inch row spacing. Strip tilling is normally done in the fall, but it can also be done in the spring before planting (Figure 9). The cost per acre is similar to chisel plow. However, chisel plow systems need an extra pass for broadcasting fertilizer and an additional tillage pass for fertilizer incorporation and seedbed preparation. Ridge till implements build 6- to 8-inch high ridges on 30-inch centers, leaving chopped crop residues on the soil surface between ridges. Ridges are typically built in the fall and then the tops are removed for seeds to be placed in during spring planting. The ridges provide a dry and warm seedbed at planting. Tillage is then limited to that performed by the planter and one to two in-season row cultivations for controlling weeds and rebuilding ridges (Figure 10). Control the height of rebuilt ridges within the season as to not bury the lower pods if fields are planted to soybeans. After planting, crop residues can cover up to 40 to 50 percent of the soil surface. This percentage will decrease after the first cultivation pass, which should be done before the crop canopies. The disk loosens and lifts the soil to a typical depth of 5 to 8 inches, with rows or gangs of concave disks set at an angle (Figure 11). If gangs are arranged with two sections adjoined on one side, it’s called an offset disc harrow. 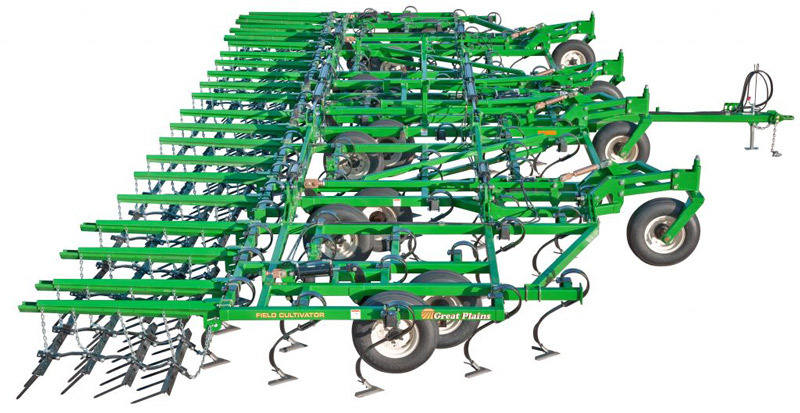 If gangs are arranged with four x- or diamond-shaped sections, it’s called a tandem disc harrow. 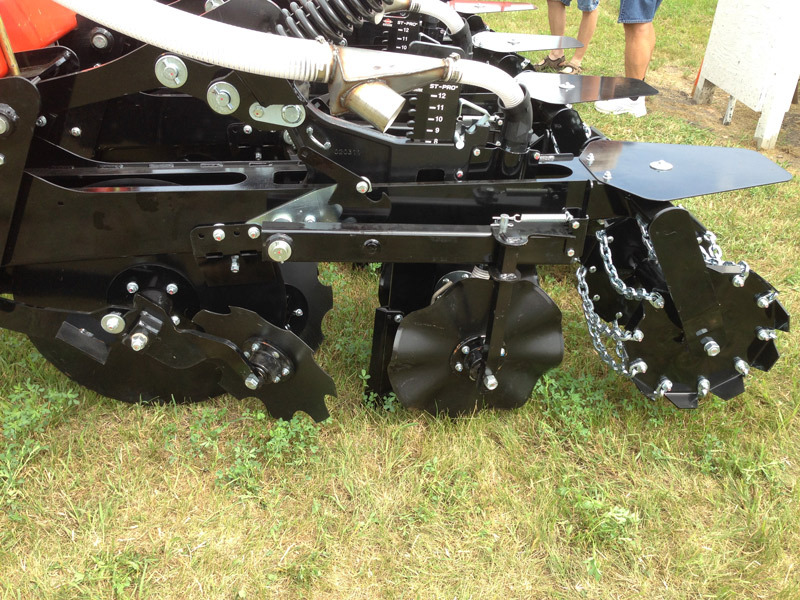 The disk is an aggressive tillage option that incorporates a large amount of residue, eliminates soil clumps and clods and loosens the depth of tilled soil. Vertical till cuts or sizes crop residue and lightly tills the top 1 to 4 inches of soil. On this webpage, we’ll consider vertical till to be any tillage operation that doesn’t cause a horizontal shearing or a smearing plane in the soil profile. This definition eliminates any use of shanks, points and disks. Most vertical-till equipment consists of vertical coulters set between 0- and 10-degree angles (Figure 12). Vertical till typically maintains a crop residue cover of at least 50 percent of the soil surface (Figure 13). However, a potential downside to vertical till may occur if crop residues are sized too small and become easily blown or washed away, reducing soil coverage. Vertical till isn’t recommended for incorporating nitrogen fertilizers because much of the nitrogen may be left on the soil surface and is susceptible to volatilization loss. Field cultivation is a common secondary tillage practice done once in the spring before planting. It pulverizes smaller soil clods remaining after primary tillage and incorporates broadcasted fertilizers (Figure 14). Field cultivators are also used as a less aggressive primary tillage practice that’s used in soybean stubble prior to planting corn. It leaves soybean crop residues covering 20 to 30 percent of the soil surface and tends to be a good option for medium-textured, well-drained soils (Figure 15). Field cultivation in the spring has a much lower fuel, time and labor cost requirement than deep and medium-depth tillage systems. 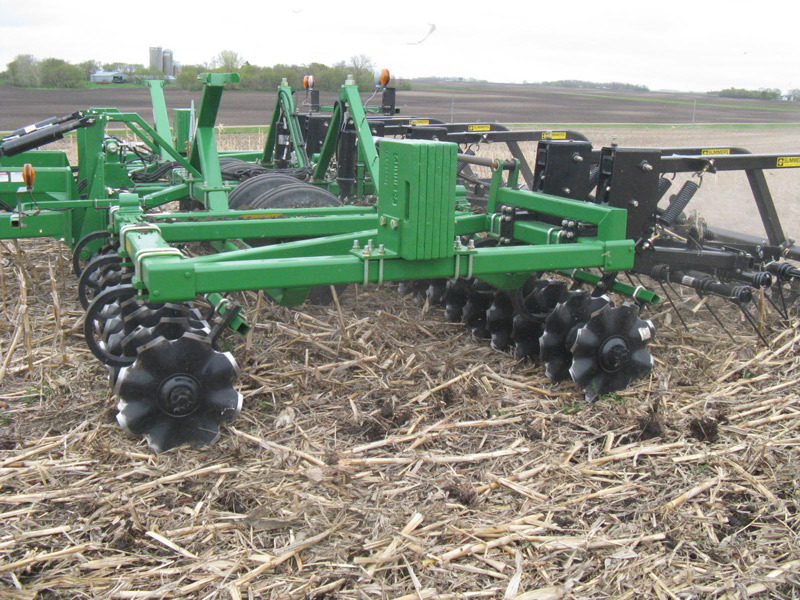 Tandem disk is similar to the disk, but less aggressive and therefore provides a shallower tillage option for the soil’s top 2 to 4 inches (Figure 16). 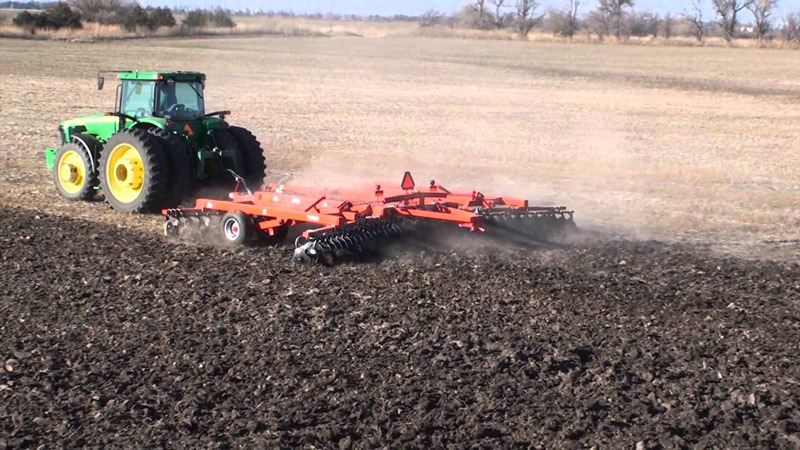 Tandem disking is a common secondary tillage practice used in the spring to prepare a smooth seedbed and incorporate broadcasted fertilizers. 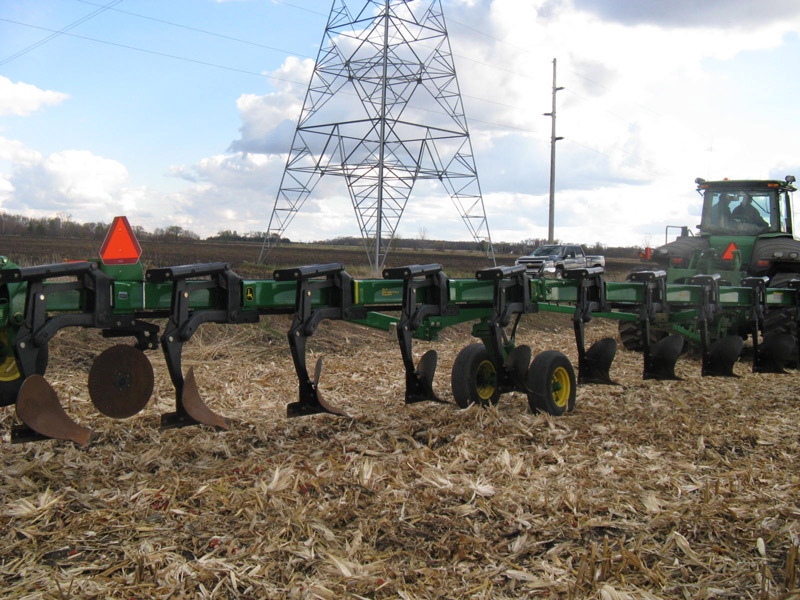 However, if used as a primary tillage tool, tandem disking can have the same potential downside as vertical tillage, as crop residue becomes prone to blowing or washing away. Figure 17: Soybean growing in no-tilled corn residue. No-till is the complete absence of any primary or secondary tillage practices with the goal of leaving the soil undisturbed as much as possible during the entire year. Most no-till planters have residue managers, finger coulters and double disk openers that move some residue from the row and improve seed-to-soil contact. Similarly, grain drills have a wavy coulter ahead of the seed tube to provide optimal seed placement. This is the only soil disturbance in no-tilled fields. The high amount of crop residues remaining on the soil surface helps maintain or increase soil organic matter, improve moisture retention and decrease soil erosion (Figure 17). No-till requires special fertilizer application techniques for corn, complete chemical weed control and specially equipped planters. 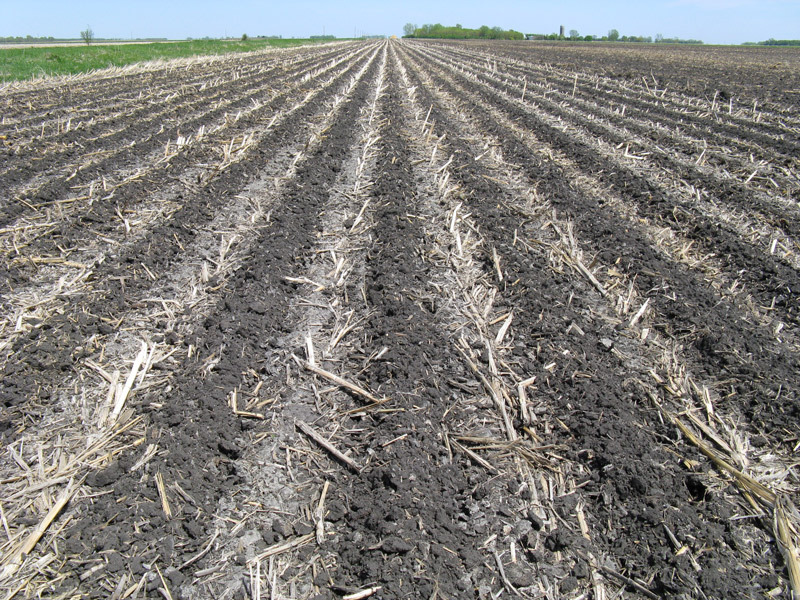 Due to the potential slower soil warm-up in the spring, no-till has typically been successful in regions with lower precipitation or well-drained coarse or medium-textured soils. Field activities performed under wet conditions often cause surface compaction. Primary tillage alleviates the problem, provided fields aren’t re-compacted. However, tillage isn’t the only way to correct surface compaction. Biological “tillage” from rotating forage crops or planting cover crops can also help (Figure 18). Perennial crops such as alfalfa, or cover crops such as annual rye or tillage radish may help break up compacted layers. Additionally, many Minnesota soils have a high content of expanding smectite clay minerals that experience annual wetting and drying cycles. These properties shrink and swell the soil, creating deep cracks that can naturally repair compaction damage. Earthworms are another form of bio-tillage (Figure 19). They create large pores, which increase water infiltration and root growth. Their castings improve microbial growth, nutrient availability and soil structure. Earthworms are quite active and feed by bringing organic debris (residue) from the surface down into their burrows. In a well-populated Minnesota soil, earthworms can recycle 8,000 pounds of soil per acre per year. Full-width tillage systems, such as moldboard and chisel plowing, disrupt earthworm channels, resulting in reduced numbers in tilled fields compared to no-till or similar low-disturbance systems. Figure 18: Cover crop roots growing through dense soil. Figure 19: Earthworm burrows in the soil. Tillage equipment manufacturers have recently been developing new technological advances for tillage implements. Companies are investing in the research and development of variable-depth or variable-intensity tillage implements that can be controlled by wireless touchscreen devices or integrated with emerging soil sensor technologies and decision-support tools, creating a fully automated tillage management system. Gates Manufacturing, a North Dakota-based company, has patented technology to sense or “read” the crop residue levels and automatically adjust the vertical-till gangs to be more or less aggressive based on the sensed reading (Figure 20). Other features include using preset gang adjustments for different fields with differing residue levels and soil texture. 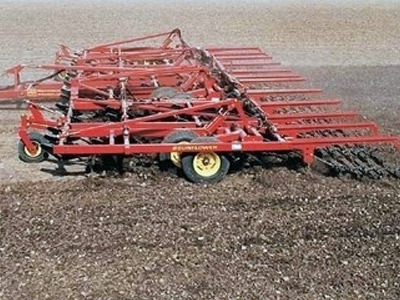 Salford, an Ontario-based company, recently introduced a variable-depth tillage implement that combines a chisel plow and a wavy coulter vertical till (Figure 21). A farmer can engage both the chisel plow and vertical till for high crop residue conditions or for clayey soils and then automatically raise up the chisel plow to only use the vertical till coulters when on slopes, sandier soils or low-residue areas. Figure 20: Gates Manufacturing adjustable gang. Photo: Gates Manufacturing. 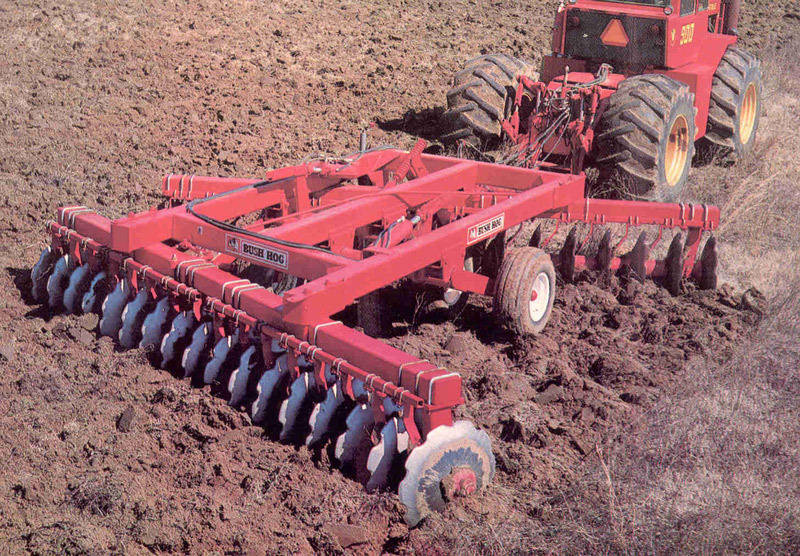 Figure 21: Salford variable depth tillage with chisel plow and vertical tillage units. Photo: Salford Group Inc.
Table 1 categorizes tillage implements based on their relative cost per acre to operate and the potential to have negative soil effects. These numbers are based on an estimate created from the Soil Tillage Intensity Rating (STIR) values of the tillage practice and the Iowa State University Custom Rate Survey. Negative soil effects of tillage include soil crusting, soil erosion, losing soil organic matter, and poor soil structure. Lower numbers from the chart indicate that tillage systems such as no-till, strip till, and vertical tillage have less potential for soil loss by erosion, will maintain soil aggregation, can maintain or build organic matter, and are less expensive to operate. Aggressive systems such as moldboard or chisel plowing and deep ripping have a much higher potential for destroying soil structure, creating individual soil particles that are prone to wind and water erosion, and cost the most in fuel and wear and tear on machinery. Note that there are a variety of tillage implements that cover the spectrum of cost and soil impacts. Shows the relative tillage equipment cost and soil impact based on a scale of 1 to 10, where 1 represents the lowest cost and least soil impact. Impact refers to the structural impact on the soil due to the depth and aggressiveness of the tillage pass. Source: USDA-NRCS and Iowa State University. A Soil Tillage Intensity Rating (STIR) of 10 or less is required to qualify for Natural Resources Conservation Service (NRCS) no-till incentive programs. The STIR value is calculated using the RUSLE2 computer model that predicts long-term average annual erosion by water. This model is based on crop management decisions applied in a field. The NRCS assigns a numerical value to each tillage operation. STIR values range from 0 to 200, with lower scores indicating less soil disturbance. Based on the STIR values, most strip-till systems can qualify for the NRCS conservation management/no-till incentive programs (Table 2). STIR values from the U.S. Department of Agriculture Natural Resources Conservation Service range from 1 to 200. Lower scores indicate less soil disturbance. Soil structure is formed by the aggregation of individual soil particles (clay, silt, sand, pieces of organic matter) into structural units or peds. Soil aggregation is the movement and then sticking of soil particles together (Figure 22). Microscopic bacteria and fungi in the soil as well as plant roots play a vital role for soil particles to stick and stay together as peds. Their sticky exudates and hyphae physically hold the soil together, helping soil structure to form and persist over time. The more diverse and abundant the microbial population, the faster soil aggregation can build. Between aggregates, many large pore spaces allow roots to penetrate the soil more easily and air and water to readily pass through. Figure 22: A well-aggregated soil. All these benefits are based on building and preserving soil structure. Tillage breaks apart soil aggregates, damaging the existing soil structure, and adds oxygen to the soil that facilitates the breakdown of organic matter by microbes. Over time, tillage reduces soil biological life. The deeper and more aggressive the tillage, the weaker the soil structure. This leads to more fine aggregates and individual soil particles, which can clog pores and crust the soil surface, slowing water infiltration and increasing runoff (Figure 23). Smaller soil particles are also highly susceptible to being swept away by wind and water. Valuable topsoil moves into the ditch, the neighbor’s field or the next state, and is lost forever (Figure 24). As the soil loses structure, it becomes denser and more susceptible to compaction, because of the loss of larger pore spaces (Figure 25). Compaction inhibits root growth and decreases water-holding capacity. Repeated tillage operations at the same depth may cause serious compacted layers, or tillage pans, just below the depth of tillage. Higher horsepower equipment is needed to get through compacted soil, which results in more wear-and-tear on equipment. Reducing tillage helps preserve the soil’s natural structure, making the soil more resistant to erosion and the negative effects of heavy field equipment. Figure 24: Windblown soil has moved from a low residue field to the adjoining ditch. Figure 25: Compacted soil layer created by annual tillage. There isn’t one tillage management system that’ll work for every field. Factors such as soil moisture and physical characteristics, slope and crop rotation play a vital role when deciding which implement is best for each field. In the Midwest, sandy and loamy sand soils warm up faster and have good internal drainage (Figure 26). However, they have lower organic matter content and don’t have soil structure. It’s not possible to create soil structure on sands and loamy sand soils, but adding organic materials can improve water-holding capacity and internal drainage. Reducing tillage or using no tillage on these coarse soils protects soil productivity and cuts yield risk. Clay and clay loam soils in the upper Midwest are rich in organic matter, which gives them their characteristic dark brown or black color (Figure 27). If managed properly, they’ll develop well-defined structure. These fine-textured soils have poor internal drainage, drying more slowly than sands. In addition, light-colored residue reflects the sun’s heat, impeding spring warm-up. With high levels of residue, these poorly drained soils may remain cool and wet long into the spring months, resulting in delayed planting. Consequently, more tillage is traditionally performed on clayey soils. Improving soil structure will boost internal drainage, speeding up spring warming and drying. Also, because systems such as strip till and no-till don’t destroy the continuity of large pores, infiltration and aeration can increase. Subsurface drainage (tile drains) also improves soils with poor internal drainage, making it more feasible to reduce tillage. Figure 26: Loamy sand soil. Figure 27: Structure of a clay loam soil. Soil moisture is probably the most important factor to evaluate. If the soil is too wet for proper soil fracturing in the fall, tillage may be creating more damage to the soil than benefits from the residue incorporation (Figure 28). If the soil is dry near the surface but wet below, shallow up the shanks or disks so they don’t smear the soil’s wet layer. A smeared soil will need an additional, deeper pass or two in the spring to break up the dense layer. For example, if a chisel plow is used in a wet soil to a depth of 8 inches, using a 3-inch spring field cultivation won’t alleviate the smeared soil layers created by the chisel plow. This situation might need an in-line ripper set at a 9- to 10-inch depth to eliminate the smeared layers created by the chisel operation during wet conditions. If the soil has moderate moisture in the fall (moisture levels below field capacity), a chisel plow or a disk ripper will incorporate some residue and break through compaction and cloddy soils. However, disks are extremely destructive to soil structure, creating a fine, pulverized soil that can easily blow or wash away. Disks can also create a plow layer because soils with poor structure compact more easily. While a dense soil may be useful in building roadbeds, it is not beneficial in crop production. Use the disk sparingly in the field. In contrast, equipment with points and shanks lift and separate the soil more along its natural fracture lines and is less destructive than a disk. If the soil is exceptionally dry in the fall, don’t use deep tillage equipment. A chisel plow set at an 8-inch depth will heave up large clods of soil (Figure 29). Experience shows that the deeper the tillage in these extremely dry soils, the larger the clods lifted to the surface. In 2011, basketball-sized and larger clods were seen across western Minnesota due to tillage during extremely dry soil conditions. Two to three tillage passes were needed in the spring to create an acceptable seedbed. Natural alleviation of soil compaction is possible in soils that shrink and swell (crack in dry conditions) during dry conditions (Figure 30). Since dry soils naturally “till” deep into the soil, farmers can focus on creating a good seedbed in the top 3 inches with shallow tillage. In dry conditions, reduced-tillage systems preserve moisture in the seedbed, enhancing uniform germination and plant establishment. 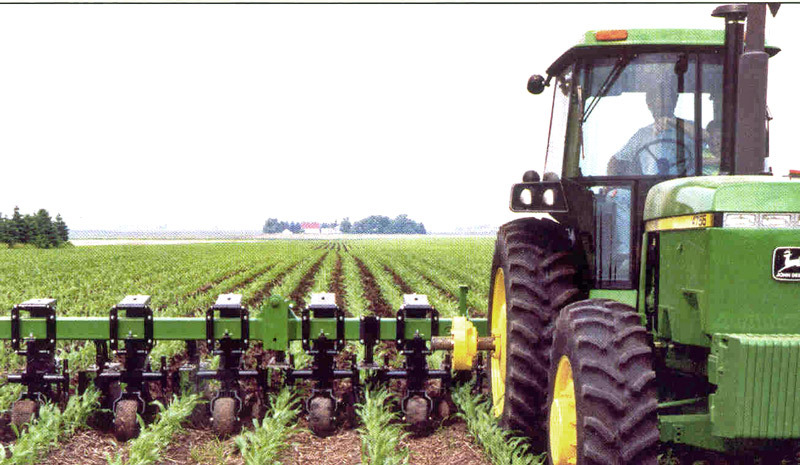 Figure 28: Cultivating the field at a depth of 3 inches in wet soil restricted corn roots from growing much deeper. Figure 29: Cloddy soil due to deep tillage in a dry soil. Figure 30: Cracks in the soil created by dry soil conditions break up compacted areas in the soil. In the Midwest, research results evaluating the effects of subsoiling have shown few positive yield responses. When yield benefits occur, they’re variable and relatively small. Accurately predicting the effects of subsoiling on crop yields is very difficult due to differences in soil texture, the level of subsoil compaction, the soil water content, subsequent traffic and differences in the crop grown and in tillage methods. In a University of Minnesota study near Waseca, a field was uniformly compacted with a grain cart weighing 20 tons an axle. The field was subsoiled to a depth of 16 inches to break up the compacted soil (Figure 31). Subsoiling failed to increase yields on the 20 ton per axle treatments for either corn or soybeans and decreased corn yield 11 bushels per acre in one of the two years. Similarly, a two-year study near Elrosa found corn and the following soybean yields weren’t affected by subsoiling to a 20-inch depth. Figure 31: A field subsoiled to a depth of 20 inches in a wet soil near Elrosa, MN. Determine if a compaction problem actually exists. Dig some plants to examine rooting. Are visual crop symptoms consistent with past wheel traffic? Is there standing water after a rain that also shows a pattern consistent with wheel traffic? Determine the depth of the compacted layer. Set the tillage implement 1 to 2 inches deeper than the compacted zone depth. Make sure the soil is dry and fractures to the depth of the shank when subsoiling. Leave some areas of the field not subsoiled for yield and visual comparison. Avoid re-compacting loosened soil by avoiding future operations on wet soils and using the controlled traffic concepts. Sloping fields are prone to water erosion. Erosion potential depends on the slope’s length and steepness and the soil texture (Figure 32). Highly erodible land (HEL) may require large reductions in tillage intensity to limit erosion and maintain soil productivity. Flat fields have less erosion potential, but sediment loss can be a problem on these fields during intense rain or wind events. Reduced tillage leaves more residue on the soil surface. Figure 32: Eroded hilltops near Fergus Falls. This residue protects the soil from raindrop impact and slows the downhill movement of soil and water. In addition, standing residue will slow the wind’s erosive speed and wick rainfall into the soil faster than bare soil. If fields have more than a 3 percent slope, minimize the depth and intensity of the tillage pass. The steeper the slope and the more aggressive the tillage, the more mid-slope buffers and planting on the contour are needed to have a return on investment. A handful of creative farmers won’t till the tops and sides of slopes in the fields, leaving the residue to protect the vulnerable soil. Crops differ in their adaptability to respond to soil temperature and moisture. Corn, a determinant crop, is sensitive to moisture and temperature. High levels of crop residues can cause uneven emergence and may decrease corn yields. On the other hand, soybean and wheat have a greater ability to thrive in a large range of crop residue levels. The amount of residue in a field before tillage depends on the previous crop and yield. Corn, for example, generates much more biomass than edible beans, soybeans, potatoes or sugarbeets. This is why it’s easier to maintain higher residue levels following corn using a variety of tillage systems. Residue durability also differs by crop. While corn residue slowly breaks down, soybean residue is fragile and easily destroyed by tillage. Maintaining adequate residue cover following soybeans is more difficult (Figure 33). Consider the entire crop rotation when evaluating residue cover and tillage systems. In general, a corn-soybean rotation offers more tillage flexibility than continuous corn. While not a tillage issue, it’s very important to spread residue over the combine’s width to prevent strips of higher residue levels directly behind the combine (Figure 34). This area of high residue can create uneven residue incorporation during tillage and uneven seed placement during planting. Chopping heads and chaff spreaders can help evenly spread stalks and chaff across the field. Many different tillage choices are available. If you have a two- or three-year crop rotation (corn-soybeans, corn-soybeans-wheat), a less aggressive tillage pass can be very effective at managing the crop residues. However, fewer choices are available to handle the high residue levels of three or more years of continuous corn. Each implement has benefits and challenges. Managed properly, the beneficial aspects of maintaining high levels of crop residue with reduced-tillage systems outweigh the few negative aspects. Look at your specific situation (soil texture, crop rotation, slope and soil moisture) to decide what’s right for you. In the end, reducing your tillage is key to your soil’s long-term productivity. Figure 33: Residue cover directly after harvesting corn (top) and soybeans (bottom). Source: U.S. Department of Agriculture Natural Resources Conservation Service. Figure 34: Spreading out chaff evenly behind a combine. When possible, wait until spring to till, especially on fields with soybean residue. 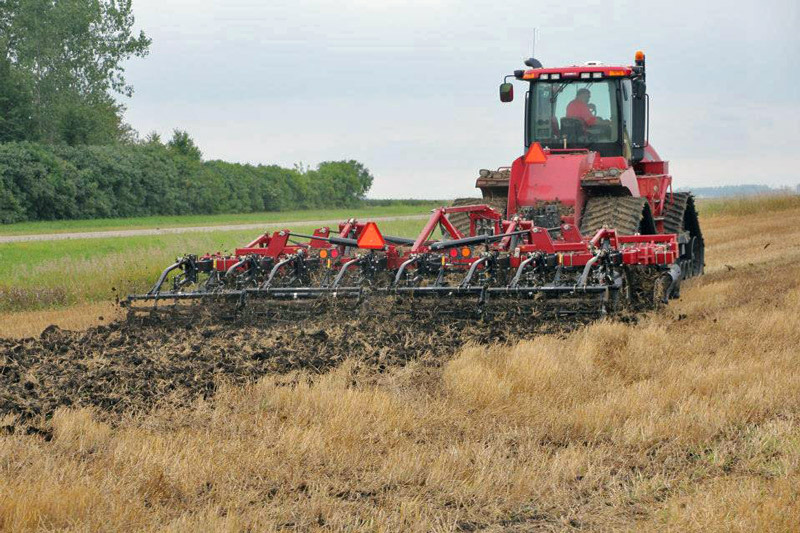 Where fall tillage is conducted, use systems that are done on the contour and leave 40 to 50 percent residue. Reduce the number of tillage passes. Set chisels and disks to a shallower depth. Use straight points or sweeps on chisel plows instead of twisted points. Plant a cover crop, especially after low residue or early-season crops. Spread residue evenly with the combine. Minimize tillage operations up and down slopes. Avoid working the soil when it’s wet. Hanna, H.M., S.W. Melvin, and R.O. Pope. (1995) Tillage implement operational effects on residue cover. Content is a collaboration between the University of Minnesota and North Dakota State University. Peer review was provided by Richard Wolkowski, emeritus Extension soil scientist, University of Wisconsin-Madison. Photos are provided by Jodi DeJong-Hughes unless noted otherwise.